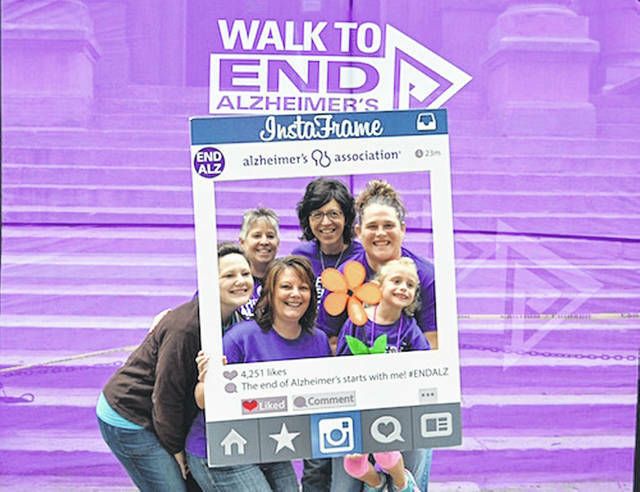 The Walk to End Alzheimer’s will be held Sept. 22 in Sidney. SIDNEY — The Alzheimer’s Association Miami Valley Chapter is inviting Shelby County residents to join the fight to end Alzheimer’s by participating in the 2018 Walk to End Alzheimer’s on Saturday, September 22. The Shelby County Walk will take place at the Sidney Courthouse Square, 100 E. Court St., in Sidney. Registration begins at 9 a.m. The walk begins at 10 a.m. Walk to End Alzheimer’s participants will complete a two-mile walk and will learn about Alzheimer’s disease, advocacy opportunities, clinical studies enrollment and support programs and services from the Alzheimer’s Association Miami Valley Chapter. Walk participants also honor those affected by Alzheimer’s disease with a poignant tribute known as the Promise Garden ceremony. Walk Committee Member Jenny Huelskamp says the Shelby County Walk to End Alzheimer’s is an annual tradition for her family. “The Walk to End Alzheimer’s is truly a day of showing support and love for those facing Alzheimer’s. I’ve been participating in the walk for years with my family and I always leave feeling hopeful and refreshed that we can make a difference to end Alzheimer’s,” Huelskamp said. The Alzheimer’s Association Miami Valley Chapter serves a nine-county region, including Shelby County. Last year about 30,000 people in the region were living with Alzheimer’s. More than 5 million Americans are living with Alzheimer’s disease, the sixth-leading cause of death in the U.S. and the only disease among the top 10 causes that cannot be cured, prevented or even slowed. Additionally, more than 16 million family and friends provide care to people with Alzheimer’s and other dementias in the U.S.
Register today. Sign up as a Team Captain, join a team or register to walk as an individual at alz.org/walk or call 800-272-3900.